On this project we worked closely with a designer to take out a couple sections of a wall as well as extend a wall while re-working the electrical lines. The room was previously a closet that previously did not use the space efficiently. 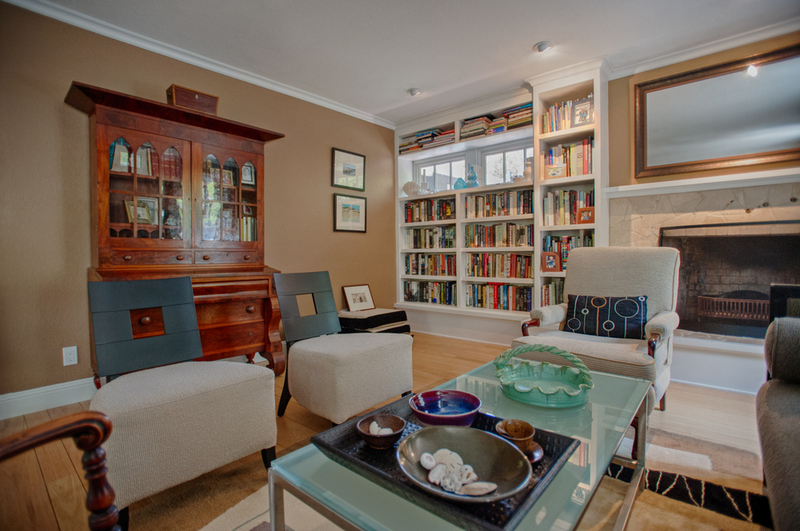 The reading nook and desk area provide a lot of function to the room without shrinking the usable space within it. Back in our shop we custom built the drawer sets and built in storage areas for the room. Parts of the project had to built in the room due to constraints of the building. Part of the challenge on this project was building pieces that would fit up the narrow staircase within the home. These custom built shelves help transition two rooms together while disguising a break in the ceiling and wall. The countertop is solid walnut with a clear coat on it. The middle section is fitted with fixed shelves where the shelves on the edge are made to be adjustable in height. This Danville home we did a like for like replacement on the cabinets meaning that the cabinets were replaced in their original position but with a few minor changes. The archway above the stove was previously supported by the cabinets. We built a supporting structure for the archway in order to replace existing cabinets. The drop ceiling was removed and replaced along with the lighting in the ceiling. The homeowner was concerned the kitchen floor may get damaged in the process of the job. We took special care to avoid any and all damage to the floors while replacing the cabinets and the ceiling. And we did it successfully.